I heard about Jordon over at Love Always, Nancy J doing a Glam Series link-up and it got me really excited to say the least. I am always curious to find new products that people swear by so a link-up like this is right up my ally. The first in the series is basic skin care. I feel like I've had the same routine since I was a teen- creature of habit much? With that said, behold my skin care routine and I can't wait to read all the others - Happy Almost Friday Ya'll! Be sure to link-up and join in! 2. Ladies, you have to start an anti-wrinkle/aging routine like now! 4. Don't laugh, but I met a woman (who revealed to me that she was 56) and she did NOT look a day over 28. I begged her to tell me her skin/night routine and she laughed and told me that she puts olive oil on her skin every night. I thought what in the world? But I finally picked up a 'nicer' olive oil from Trader Joes and so far I've been doing it 1 to 2 times a week/ Use a headband or tie your hair back, apply with a cotton ball and watch TV or something for an hour or so. Next, blot with a tissue before bed since it can get messy and wake up to super soft skin! 5. Moving into day time, my two FAVORITE primers ever are Two Faced and Benefit's Pore-fessional! 8. This is my holy grail ya'll- benefit makes the best pressed powder called Hello Flawless. You can wear it completely alone or dust over your foundation for the perfect airbrushed look! I love this stuff and I am NEVER without it! I've heard of using olive oil before bed before, now I totally need to try it! Ohhh, you have some products I definitely want to check out. I have never heard of putting olive oil on your skin before bed. I did just read recently that makeup wipes are awful for your skin (rough and the chemicals aren't good either). I love this link up idea, I need to share my products that I use! Oh I haven't heard that! I use olay make-up wipes just for under-eye make-up left behind though! I'm definitely going to try the olive oil trick! I have the worst dry skin and I'll do anything to help it haha! 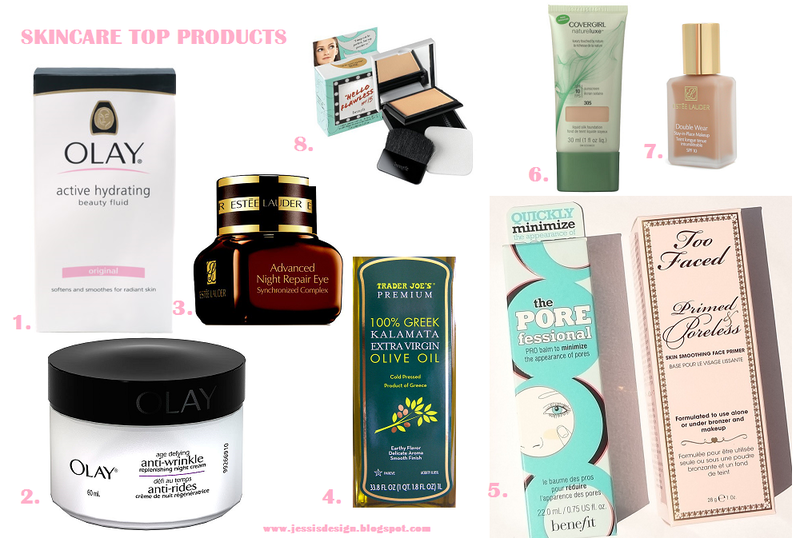 Love Benefit products - they can do no wrong! I need to try that Advanced Night Repair made by Estee Lauder!!! I love their products! it's great and not sticky! I am on the market for a new moisturizer! Maybe I will try this olay! I need #2 and #3 stat! Are they pretty pricey? the estee lauder one can be but sometimes they give you a small sample (which lasts forever!) The Olay one is less than $20 and a great starter cream! I have used olive oil before to take off makeup, but I've never left it on that long. I'm interested to try your routine with it! Double wear is my absolute favorite foundation!! Love!! I love the EL Advanced Night Repair! I hate the price tag, but skin care is something that I'll let myself splurge on. I already have the slightest little lines on my forehead and it kills me...they're barely noticeable now, but I worry what they'll look like in the years to come. I am definitely all about trying to tackle wrinkles now! yess!! They are starting under my eyes and it is KILLING me hahaha- plus I've always read that the earlier to start the better! !